What could be more touching than this beautiful display of fresh roses and daisies tucked inside a quaint wicker basket? The precious blooms will arrive artfully accented with million star gypsophila and fresh greenery, making for a eye-catching display. Measures approximately 13" x 14.5". During checkout, please be sure to indicate your preferred occasion when you choose a gift card. Exact flowers and basket may vary depending upon location and availability. 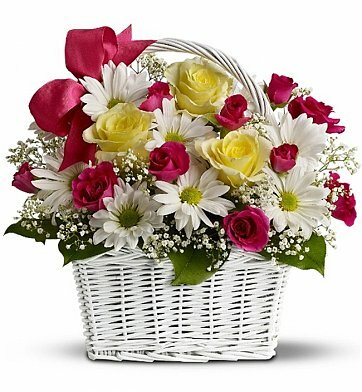 Darling Daisy Basket is a hand delivered gift. These gifts are delivered by one of our local design centers located throughout the United States and Canada. Same day delivery is available for most gifts when ordered before the cutoff time. The cutoff time for Darling Daisy Basket is 2 PM in the recipient's time zone. This order was delivered on time and the price was just right, I'm sorry I did not find this site before, my sister loved the flowers. They were very fresh and lasted a long time, my sister is handicapped and I was not able to see her on Mothers Day, these flowers brought a smile to her face. I will be placing all my orders here in the future. This is a very beautiful flower basket. It was delivered in a timely manner. Absolutely perfect! Thank you for the wonderful flower basket, mylar balloon & cookies package for my daughter's birthday. The flowers are beautiful and fresh. She loved it. Thank you very much for making a young lady's birthday special. Very pretty and sweet and substantial for the price. This basket of beautiful flowers has given my niece several days of joy. The arrangement was beautiful, my mother was thrilled with them and they were delivered right on time. Thanks. I sent this to a very dear friend who is like a second mother to me. It was her 87th birthday. She called to rave about how beautiful the arrangement was. I did not see it, but she seemed to love it. I shop here all of the time and those who have received these flowers and gifts have always been very happy. Of course, that makes me happy and a repeat customer. My daughter loved the arrangement. Very abundant. The roses were a softer pink than shown in the photo which added to the Spring like appearance. It reminded me of my wedding bouquet. More than a week later the daisys are still fresh as a daisy! The roses are barely open but past there prime. This is one of my favorites to send for everything, birthday, get well, condolences, etc. Everyone I have sent one to has commented how much they like this arrangement.